Check out the Poker features that make Bovada one of the best places to play online poker. We're always improving our software to make your experience better. Check back regularly for all the latest gaming features and enhancements. One thing players appreciate about Bovada is our dedication to improving the user experience. We don’t clutter up your poker with high-res graphics or lagging loading screens. Bovada tables load quickly for a fluid experience with straightforward icons, player indicators and buttons so you can focus on your game, nothing else. Our mobile poker feature offers a tidy, user-friendly interface with easy-to-use betting options. Simply visit our free-to-use mobile site with your smartphone or tablet and play on the go. The best in online poker action is at your fingertips with Bovada Mobile Poker. With Quick Seat you can be seated at a cash game table in two simple steps, and that's just the start of the awesome benefits. Find out more about Quick Seat. Get social with the easy-to-use chat feature with access to phrases and emojis at the click of a button. Want to tune out the noise and focus on your hand? Simply turn off chat for the entire game or a specific player. Zone Poker is designed to cut out the time spent waiting for your folded hands to end and new cards to be dealt. The moment you fold at a Zone Poker table, you’ll instantly be redirected to a new table with new players. This fun, fast-paced poker format gives you the chance to see more hands and play more in a shorter period of time. Read about Zone Poker. Start with a clean slate every time you sit down at one of our tables. This feature allows Bovada players to enjoy online poker with total anonymity, meaning that when you sit down at a table, your opponents won’t know who you are, what your poker style is, or what you’re capable of doing. With every new game, our anonymous tables feature creates an equal playing field for everyone, just like in a live casino. Read more about our Anonymous Tables. What are your chances of winning the main pot? Now, if you go all-in on a hand, a clearly-marked percentage bar will show up under the cards of each all-in player to indicate their probability of winning. The percentages appear as soon as the cards are shown and update after each action. Recreational players and pros alike will appreciate our easy-to-read, adaptable tables. Bets, pots, split pots, new players and hand strength are always clearly displayed throughout play, action buttons adapt to the current situation, and inactive players are easy to spot, so you only need to worry about who’s in the game. Liven up the action with our selection of four unique card designs. You can now intensify your gaming experience by selecting one of our dynamic designs to customize your playing cards. Update the look of your table and background to enhance your playing atmosphere with multiple, customizable tables. We’re offering a racetrack theme in five colours including: red, blue, green, orange or magenta. Simply select Settings ->Table Settings and use the drop-down menu to browse your options and enjoy. Wanna switch spots? Interact with vacant seats easily and change positions with a quick left click. You can also more info about your game via the collapsible notifications panel. Poker is a game enjoyed around the world, and now you can play in the language you’re most comfortable with. Bovada Poker is available in English, Simplified Chinese, Spanish, Thai, Japanese and Portuguese. 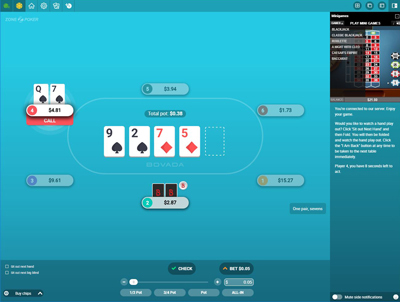 Watch your previous hands as they develop and relive the action using our hand history viewer. 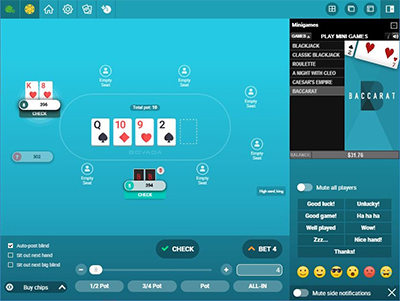 This exciting feature allows players to revisit previous hands and watch the action unfold in front of their eyes a second time around. The hand history viewer provides fast-forward and rewind buttons, giving you complete control over what you want to view. The viewer is a great tool to help you analyze and improve your game and your own playing style. The viewer is available for Cash Games, STT’s and MTT’s. You can activate the hand history viewer directly from the table you’re playing from or from the hand history details page. This unique feature gives you the ability to view everyone’s hole cards from your previous poker sessions. Full hand histories will be view-able in the software 24 hours after the completion of a scheduled tournament, Sit & Go, or cash game hand. These complete hand histories will reveal the hole cards of all players, regardless of whether they played the hand or not, offering extra insight into how the previous hands unfolded. If you find an opponent you enjoy playing against, you can now keep the fun going thanks to Bovada’s Instant Heads-Up Rematch feature. This option allows you and your fellow player to return to the same table and get back to the action while the chips are still hot. As soon as a Heads-Up match is completed, you will be given the option to rematch your opponent. If they also agree to a rematch, a new Heads-Up game will start instantly. For a more exciting and rewarding Zone Poker experience, you can now play two entries at the same time in a single player pool. When you buy in to a Zone Poker table, you will have the option of playing one or two entries. Gain that extra edge by analyzing and noting your opponents’ playing tendencies in a cash game or tournament. You can take single-session notes quickly and easily during a tournament, Sit and Go or cash game. If you’ve ever wondered what turn or river would have been, you can satisfy your curiosity with the Rabbit Cam. It’ll show you what the next card dealt would have been when a hand completes after the flop or turn, but before the river has been dealt. If a hand completes after the flop, the turn card will be shown. If it completes after the turn, the river card will be shown. Opponents who mucked no longer show their cards in the viewer. To take a peek, you’ll have to view the text version of the hand history. Play between one and 15 tournaments; the choice is now yours. You can still play up to four Cash and Sit and Go Tournament tables simultaneously, but you now have the option to play even more Multi-Table Tournaments, up to 15 total tables, at the same time. All your favorite casino games are just a few clicks away. Discover a full range of high-quality casino games and mini-games embedded right into the poker software. Choose from 3D, video and progressive slots, blackjack, roulette, video poker, specialty games and more while you're hitting the poker felt. There’s also Blackjack, Baccarat, Video Poker, Craps, Slots, and dozens more games you can play at Bovada Casino. You can also play any of these games at Bovada without leaving the poker client. Just go to the menu in the poker lobby and select Casino Games. Find out more about Bovada Casino Games.